Are you a PartyWith kind of person? PartyWith is a free new app (available on iOS and Android) that lets people who don’t know each other meet up for a night out together, and perhaps even have a bit of a party. It’s available worldwide, but obviously the major action will be happening in big cities like London, Amsterdam, New York. You can view nearby events that other users have created. If you’re interested, you can list yourself as attending and join in the group chat. Just like Facebook Events, really. You can find people nearby with a similar profile to yours. Start chatting to them, and you can arrange to meet up. You can post your own event ideas, and invite others to join in. The PartyWith website has some great user stories that make it easy to see the attraction of an app like this. Let’s say you’re on your own in a new city, and you’re at a loose end. Why not arrange to party with a local rather than hitting the usual tourist traps? Or if there’s an event you want to attend, but your friends aren’t too fussed about it, you can use PartyWith to find others who might appreciate it a little more. What do you think? 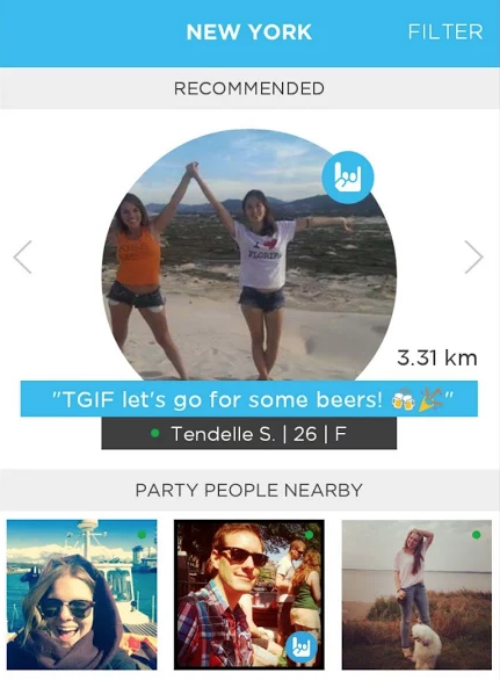 Will you be using PartyWith on your travels? Or will you be hooking up with strangers to show them what your home city has to offer? Feel free to share your thought below.